The Wright State University women’s volleyball team defeated host West Virginia University and finished second overall at the West Virginia Invitational volleyball tournament, Aug. 24-25 in Morgantown, W. Va.
MORGANTOWN, W. Va. — The Wright State University women’s volleyball team came out strong and stayed strong to defeat host West Virginia, Aug. 25, at the West Virginia Invitational, 3-1. “We just beat a very good and talented West Virginia team in four sets. We came out today and wanted to compete and that’s what we did today. Teddie (Sauer) was the MVP and Abby (Barcus) was named to the all-tournament team. I am really proud of the players, it was a great win for the team and the athletic department,” said Coach Allie Matters. It was WSU’s first win over a Power Five Conference member since 2006. The Mountaineers are in the Big 12 Conference. The Raiders took control early with a 5-1 lead and increased it to 19-11 to win 25-20 in the opening set. In the second set, Wright State was up 23-20 and thwarted a Mountaineers comeback attempt to win 27-25. The set was tight throughout with the Raider three-point lead being the largest lead. In the third, WSU led 16-11 but the Mountaineers came back to win the set 25-19, scoring the final five points. Jumping out to a 6-1 lead in the fourth, WVU could only tie the score at 10 and 13 before the Raiders extended their advantage to 21-15, winning the fourth set 25-21. 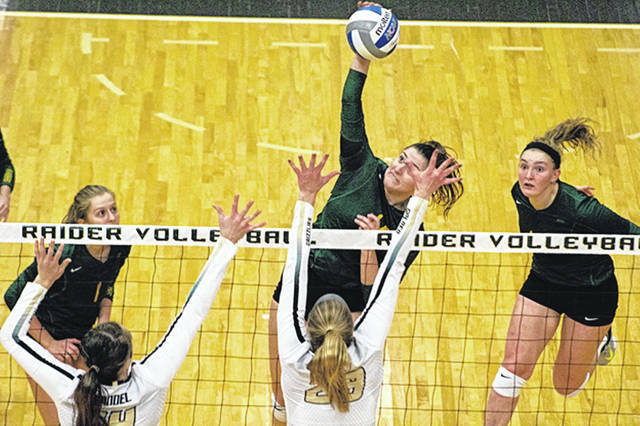 Three Raiders ended in double-figure kills with Barcus and Sauer at 11 and Powers at 10. Alannah Lemming had nine kills, hitting .400. Lainey Stephenson finished with 36 assists, and seven kills, and Jenna Story posted 30 digs. Wright State’s Barcus and Sauer were named to the All-Tournament Team, and Sauer was named the MVP. The Raiders defeated Georgia Southern 27-29, 25-13, 23-25, 25-18, 15-8; but lost to the University of Connecticut 25-22, 23-25, 25-22, 19-25, 11-15. Despite the loss, West Virginia walked away with the 2018 WVU Invitational title. The winner was based on a set-percentage tiebreaker due to West Virginia, Wright State and UConn sharing a 2-1 overall record at the two-day tournament. The Mountaineers were 8-6 with a set percentage of .636, while the Raiders finished as the tournament’s runner-up with a percentage of .571. UConn came in third (.461) with Georgia Southern fourth. The Raiders (2-1) will play matches against Mercer, Saint Francis and Morehead State, beginning Saturday, Sept. 1 in the Comfort Inn-vitational in Morehead, Ky. For more news on Wright State University athletics, visit wsuraiders.com . https://www.fairborndailyherald.com/wp-content/uploads/sites/50/2018/08/web1_volleyball-1.jpgThe Wright State University women’s volleyball team defeated host West Virginia University and finished second overall at the West Virginia Invitational volleyball tournament, Aug. 24-25 in Morgantown, W. Va.